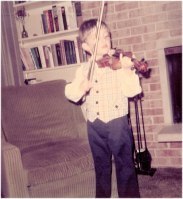 Since the early ’90s I have taught both violin and viola and do so now in my home in Douglasville, GA (I will travel within 10 miles based on availability and schedule). I am a patient and fun instructor who enjoys making children smile while they are learning. I do have expectations, but I am not the yelling kind of teacher. I teach all ages from 5 (I prefer students to have at least some ability to read English before teaching them to read music) to, well, older than that. Students of mine will be provided with a well-rounded education including songs, etudes, scales, and music theory. I like my students to understand why the music sounds like it does. No playing-by-numbers for my people, thank you very much! For most students, I teach a modified Suzuki method. That means I use the books for repertoire (at least for a while), but I don’t do the group lessons nor do I insist students buy the CDs. An example would be; I have a beginner student who is half-way through book one. We took a break in the fall to learn Jingle Bells so he could play it for his family at Christmas. Right now, we’re working on Happy Birthday. I often use my own arrangements or even original compositions and exercises. I have distinct opinions on how students should learn. I am also flexible. What works for one student may not work for another. All in all, I want students to enjoy learning music, but I tell them that in order to get better, they have to practice at home. Click the “email me” link below or find me on Facebook or Twitter. My rates are reasonable, and the education that my students receive is invaluable.